WBC 2014 EVENT PREVIEWS: Ah ... spring. It's getting to be that time of year again when the birds sing, the flowers bloom and tournaments are previewed as only WBC does them. Check out the formats for your favorite events and get an early look at the WBC schedule before we unveil the full slate of both our usual and new scheduling aides coming in May. LAST CHANCE FOR FREEBIES: Only days remain to get a free Yearbook and souvenir T-shirt or hat for an early Tribune membership commitment. The free premiums end on April 30. Thereafter, such items will only be available for separate purchase. Tribune membership entitles you to free admission to all of WBC week plus the Pre-Cons—nine days in all. Submit your membership now to qualify. WBC EVENT GM ASSIGNMENTS: The membership is to be congratulated for stepping forward to save all but one of the eligible qualifying events from the Orphans List and in so doing tied the record for number of tournaments at WBC with 157 (109 Century/Legacy, 25 Continuing Trials, 23 Sponsored Trials) plus 20 Juniors events. Only A Few Acres of Snow was lost due to absence of a GM commitment. Unfortunately, in doing so, many GMs are doing double and triple duty so more volunteers are still needed. If you don't see yourself as a GM type, at least give some consideration to helping out next time by volunteering to assist a GM as a demonstrator or clerical assistant. The slate of 20 free Juniors events for those 12 & under can be found. Look for WBC's usual array of Scheduling devices and Pre-Registration information to be announced in our May newsletter. SCHEDULED OPEN GAMING REPLACES THE SAMPLER SHOWCASE: The portion of new game demonstrations usually scheduled opposite the WBC Auction and Auction Store has been cancelled. It is being replaced by more emphasis on individual demos and scheduled Open Gaming opportunities all week long. If you've ever bemoaned the difficulty of finding players to play what YOU want to play in Open Gaming, this is your chance. Merely commit to providing the game in question and playing at a specified time in the designated Demo area in Paradise assembly and we will reserve your table plus add your game to the printed, android and rotating schedules for all to see and even provide signage for your "game event". The catch? You must commit to it in a timely fashion; i.e., now. Must be a Sustaining or Tribune member by June 1. One reservation slot per person. Second requests will be honored on a space available basis only after all other primary requests have been fulfilled. All requests are based on availability. First come, first served. The longer your requested time slot, the less your chances of getting a reservation. Avoid high usage time slots. Slots that conflict with Tu17-22 or We17 have little or no chance of acceptance. COMMERCIAL DEMOS: In an effort to alleviate crowding in the Open Gaming theatre, exhibit tables will NOT be allowed in the Showroom. Monitors will be tasked with stricter policing of commercial efforts including prospective game designers who set up displays to troll for P500 backing. While you are free to Open Game anything you like, you will NOT be allowed to monopolize tables with displays that are not being actively played. Instead, designers/publishers are urged to register for FREE scheduled demos in the Paradise Assembly demonstration area. To be included in the schedule, you must be a current Sustaining level or higher member and register your demo no later than June 1. Demonstrations are limited to one-hour duration unless longer periods are requested in advance. Multiple or longer demonstrations are allowed on a space available basis. Contact for additional information. Include alternate times and type of table desired (either 6' rounds or 8' x 30" rectangulars) as well as boxart files containing the title of the game for display signage. Reservations will be made on a first come, first served basis. Submit requests via the Demo Form or email to conventiondirector@boardgamers.org. WBC VENDOR/EXHIBITOR LINKS: BPA welcomes Worthington Publishing, Gaming Nomads and Griggling Games as our newest vendors to join our returning favorites with a presence at WBC 2014. You can find prominent links to all of them on our homepage. CURRENT MEMBERSHIP STATUS: Those wishing to check their current membership levels may do so on the Preregistration Page. Note that only Sustaining level members and above will be listed until General memberships become available with the appearance of the Pre-Reg form in May. WBC SCHEDULING APP FOR ANDROID: We are currently working on a WBC App for the Android platform with lots of positive feedback and once tested and bug free we will look to expand to the IOS/Apple platform. 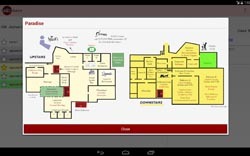 The app is in the beginning stages but the plan is to allow a completely customizable scheduler for each user with room maps and other goodies. You can download the BETA version of the WBC Android app and give it a try. Send feedback to Scott Nerney (nernman@gmail.com) as he is coordinating the process with our build team. ELECTION TIME: It is once again time to elect three members to three-year terms on the BPA Board of Directors. This year's election features two incumbents and two past Board members vying for three seats. Cast your vote to determine the odd man out. As usual, voting is effortless and takes only a moment thanks to the electronic ballot. Voting will remain open until July 15. All members (any paid attendee of WBC for more than one day is considered a member) are urged to vote since validation requires sufficient membership participation. MULL WINS NAPOLEONIC WARS: A rather ambitious hybrid format consisting of three 3-player games with each player playing a different side once followed by the top six engaging in 2-player elimination rounds has ended with Rob Mull triumphant over Lance Roberts with a French +10 VP win following a Turn 3 Peace die roll. The field of 34 also provided laurels for Rich Shipley, Michael Day, Rachael Day and Scott Fenn respectively finishing third through sixth. The updated laurel totals for the event are posted on the BPA Napoleonic Wars page. MARCH MADNESS: Robert Kircher has secured the last spot in our Final Four. His 12th seeded Auburn 1999 team will face Max Jamelli's 14th seeded San Francisco 1956 squad. Meanwhile, Sean McCulloch's 4th seeded UCLA 1975 team is having its way with Aran Warszawski's 35th seeded Oklahome State 2005 team with an early 37-16 lead before the half in the other semifinal pairing. Follow the action at http://www.nktelco.net/bdmonnin/mm-brack-2013.htm. FOR THE PEOPLE: While the 2013-2014 FtP tournament continues in its single elimination phase, the 2014-2015 FtP tournament is now accepting players for the Swiss phase. Sign up now for the round starting May 1. Everyone plays six games in the Swiss phase, advancing 8 players to Single Elimination. Check out the tournament format at http://forthepeopleqa.wordpress.com/ftp1415/. Sign up with your email and ACTS ID by posting a comment at that site. If you have any questions, email GM Tim Tow at towtim@hotmail.com. GETTYSBURG: The first round of the 4th PBeM tournament has advanced 16 players with the higher seeded players winning 80% of the first round games. The Union has also taken a surprising lead in the victory column—reversing a WBC Confederate advantage while bidding has also declined to reflect greater perceived play balance. The second round ends July 16. Details can be found at http://wargameacademy.org/G88/G88-BPA-PBEM-IV/index.html. SPEED CIRCUIT: Jeff Cornett, Robert Rund and Mike Aubuchon won their respective races in the second heat at Singapore to qualify for the Final at New Delhi. Joining them in the championship race will be Tim Mossman, Doug Schulz, Will Kenard, Rob Kircher, Buck Karpowitz, Bruce Rae, Martin Burgdorf, Curt Collins, and Chris Hancock. PRO GOLF: Harry Flawd, George Young and Robert Kircher are the early leaders in the clubhouse at five under par, with Alexandra Monnin with the same score after 16 holes. Watch out for Pete Stein, one stroke back with eight more holes still to play. With 12 of our 51 golfers still on the practice tee, it is tough to predict the first round cut line. Last year, 1 over par was good enough to advance while 2 over par was not. This year it is looking like even par may be needed. It is still too early to call. Golly ... exciting stuff! For the scorecard for this year, see: http://www.nktelco.net/bdmonnin/PBeM_Scoresheet.htm. WAR AT SEA: Seven games still remain uncalled in the 4th round, but Andy Maly and Jon Lockwood are safely anchored in undefeated waters going into the final swiss round. Clinging to a more perilous grip on the playoffs are Ed Menzel, Dennis Nicholson, Rob Flowers and Don Greenwood respectively. The current standings can be found at http://www.nktelco.net/bdmonnin/BPA_WAS_Swiss_2014.htm.